Festive, fun, flavorful, and best of all, fuss-free! This salad takes little more than slicing, dicing, and rinsing a few ingredients, and tossing them in a bowl. It's the perfect dish to bring to any summer party (especially a 4th of July one! Hellooooo Red, White & Blue! ), and you won't even have to work up a sweat turning on the oven. So, get ye to the store, grab the 6 ingredients this recipe requires, and be party ready and festive in less than 15 minutes! I've been on a mission lately to share all of my trusty, time-saving (and bloody finger sparing) food prep techniques. For unwieldy, round, hard to cut fruits and veggies, getting a flat surface to work with is KEY! Watermelon & jicama both fall into this round, unwieldy category, so I thought I'd show you how I handle them with ease. For the watermelon: Start by cutting off one of the ends to expose the red flesh underneath, then slice the whole melon down the middle. With the larger (middle of the melon) flat side down, remove the rind from the watermelon with a sharp knife (1st picture) by running the knife along the rind around the side of the watermelon until all rind and any remaining white flesh is removed (2nd picture). Next, slice cut in cross-hatch pattern that leaves you with tall watermelon sticks (3rd picture). Lay sticks flat on cutting board, and cut into bite-sized cubes (4th picture). A note on nutrition: speaking of watermelon, this incredible summer fruit is full of health benefits. It's over 90% water, so it'll help your body stay hydrated (and digestion on point!) on those hot days. Like all red-pigmented fruit, it's rich in lycopene - that wonderful phytonutrient (aka plant chemical compound) that acts as an antioxidant and may aid in cancer prevention. It is also loaded with Vitamins A & C, which also act as antioxidants, helping to calm inflammation in the body and protect against free-radical damage. Beauty bonus: These two vitamins help produce collagen, keeping skin and hair strong and healthy! For the Jicama: Follow the same steps as the watermelon above. Slice this juicy, crunchy, tuber right down the middle so you have a flat surface to work with. 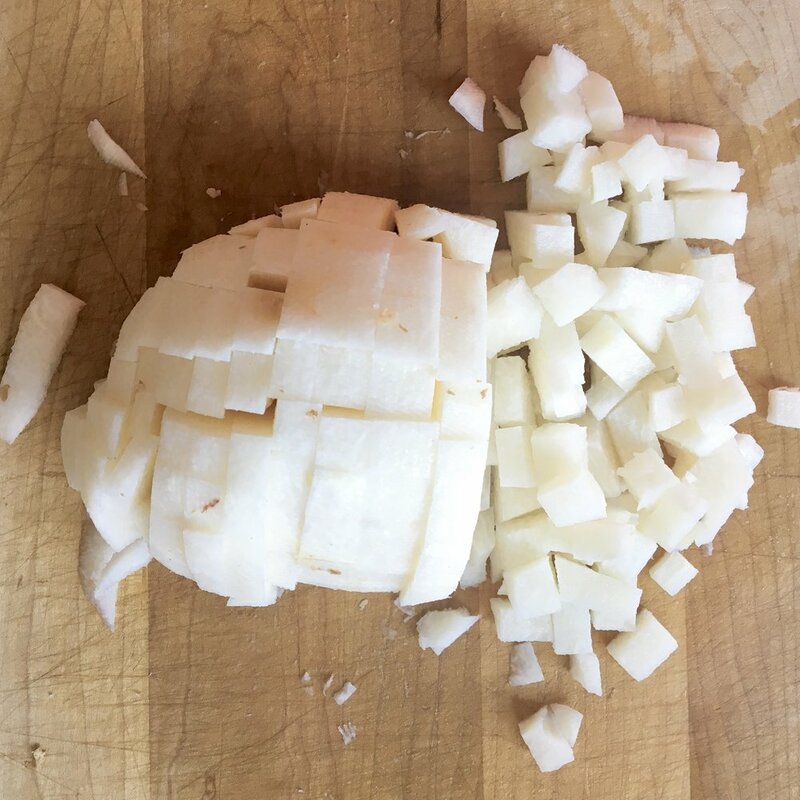 Peel the jicama with a small paring knife or sturdy vegetable peeler (1st picture above), cut in a cross-hatch pattern to make tall sticks, then lay sticks flat on the cutting board and cut into small, bite-sized cubes (2nd picture above). Never tried jicama?! You are missing out, my friend! It's a Mexican tuber best enjoyed peeled and raw. It reminds me a lot of an apple, without the sweetness. It's so wonderful shredded or cubed on top of salads or tacos, or just stored in the fridge in jicama stick form for a quick grab & go, refreshing snack. On the nutrition front, jicama is rich in fiber and Vitamin C, so it's a great way to up the satisfaction factor of your meals, and keep your digestion and immune systems humming! The above picture is everything you need to dress this salad. Yup. That's it. Just a bit of honey, lime juice, and mint. If you feel like you picked a super sweet watermelon and love the flavor and sweetness of that with the blueberries on their own, you can even forego the honey and just do a lime juice and mint drizzle! Makes: 10-12 Servings - easily doubles for a larger crowd! 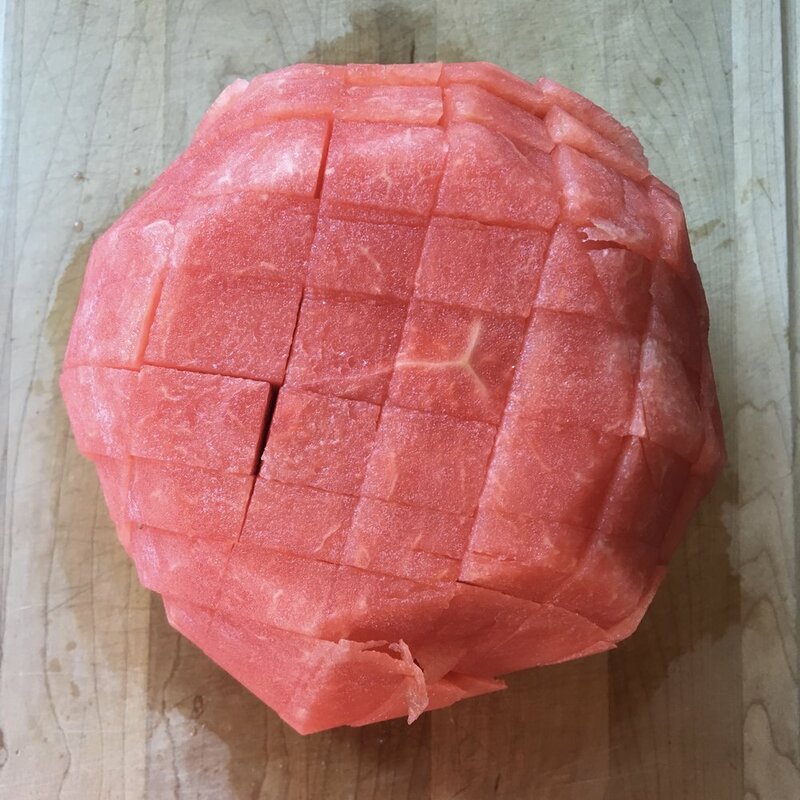 Cube watermelon and jicama as shown and described above. Arrange watermelon in large bowl, then layer jicama and blueberries in rings on top of the watermelon as pictured. 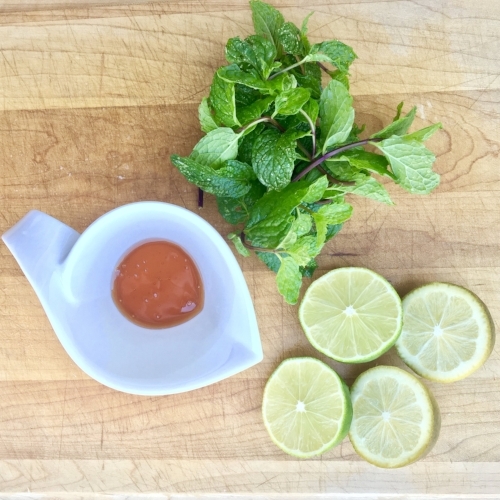 For the dressing: In a small jar, combine honey, lime juice, and 2 Tbsp of minced mint. Pour over the top of the arranged bowl of fruit. You can also double the dressing recipe and leave some extra on the side for those who might like some extra honey and lime flavor. Sprinkle remaining 2 Tbsp of minced mint over the top of the fruit salad for a nice pop of color. Dig in and enjoy staying hydrated and healthy!